The black points plotted below represent the number of active Facebook users u, in millions, t months after December 2004. For example, in December 2005, there were about 5.5 million active users, so the point (12, 5.5) is shown. The data ends in July 2010. The blue graph shows an exponential model for Facebook's growth. The green graph shows a logistic model. 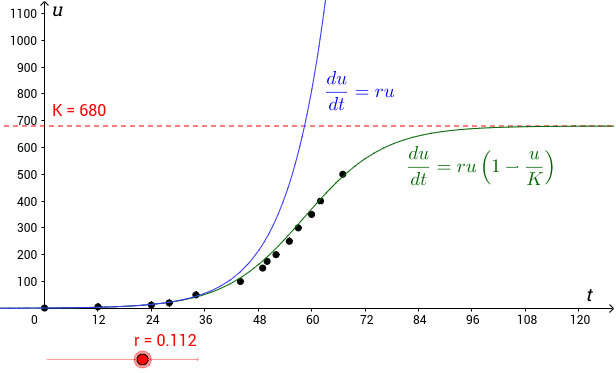 You can drag the horizontal red line, and use the red slider below, to try changing the two parameters r and K. Note: Exponential and logistic models are usually pretty good at describing the spread of an infectious disease. Exponential models are generally only accurate in the short term, while logistic models may be more useful in the longer term.